Howdy Marcel! What's your background, and what are you working on? My name is Marcel Petitpas and I’m Co-Founder and CEO of Parakeeto. I’m 25 years old and am based in Moncton New Brunswick, Canada. Parakeeto is a platform that helps creative agencies make more money by tracking their profitability in real time. Our vision is to become the best business intelligence tool for service businesses by helping companies automate their operational reporting and forecasting. What motivated you to start Parakeeto? Before starting Parakeeto, I had spent roughly three years exploring and attempting to validate different ideas for SaaS. However, none of my ideas ever really stuck or got the level of traction in my validation tests to indicate a homerun. After spending a few years trying to validate various ideas, I got a call from a mentor of mine, Dan Martell, that changed everything. He told me a friend of his (My co-founder Jarod) had a great idea for SaaS; an idea that would really stick due to pre-existing demand within agencies. He said that Jarod had the technical chops but needed a young hungry CEO to run the company. If we could validate the idea, Dan said, he was prepared to write the seed check to kick things off. I got on a call with Jarod and learned more about his business and the idea. 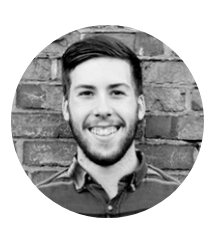 Jarod had multiple tools with which he ran his business, but they didn’t talk to each other. For example, the BI Dashboards couldn’t do the math to fully automate the reports he needed to see, and the all-in-one tools that automate this stuff were jack-of-all trades behemoths that weren’t really good at anything. “There’s no middleware for this market,” he said. “Someone needs to fix this. Agency owners like me are tired of building spreadsheets to run their business.” So that’s how I got started with Parakeeto. What went into getting your first paying customer? The first thing we knew we had to do was get some real validation, so I found a database of companies on clutch.co and used a tool called Parsehub to start scraping companies that looked like Jarod’s agency. Then I got a guy on UpWork to find their email addresses. 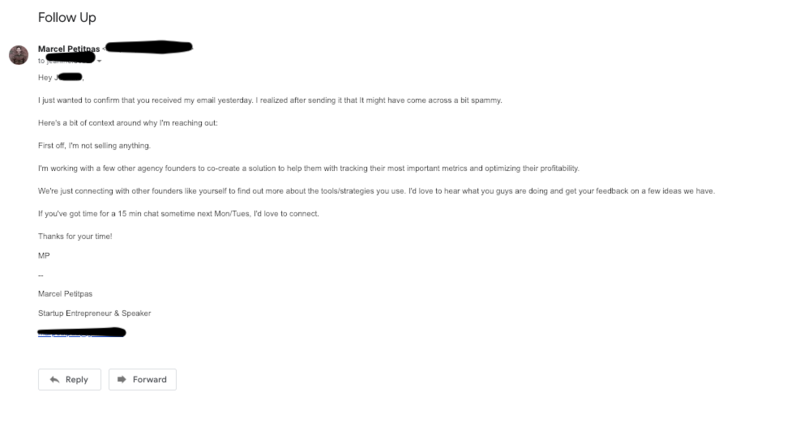 I used a tool called Yet Another Mail Merge to start sending these people emails from a Gmail account asking them if they were willing to get on a call and share some feedback with us. 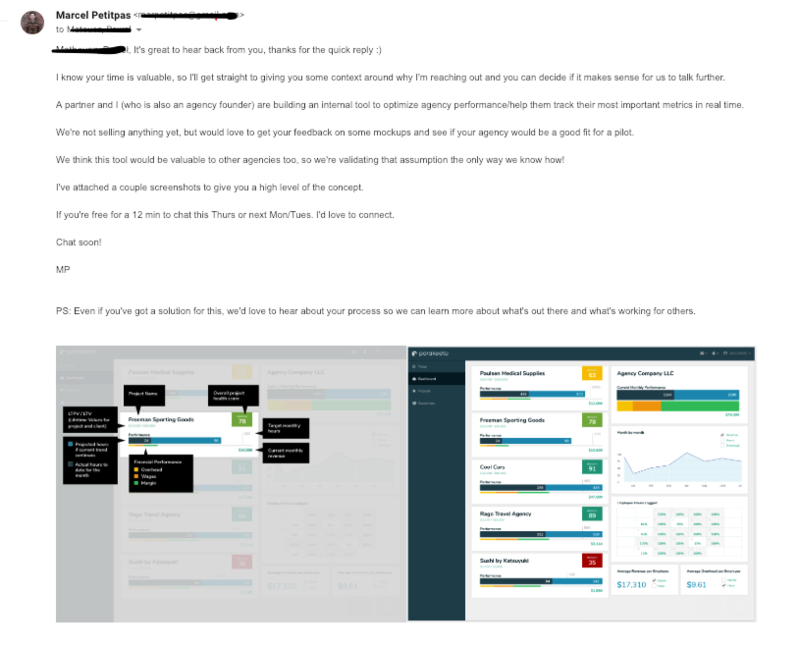 3 months and about 3000 emails later, I had conducted over 60 interviews with agencies around what kind of KPIs they tracked at their agency and how they did it. Here’s what the follow up looked like after a reply, and with no reply. We learned a lot, such as what size agencies know that they have this problem, what kind of tools they use, and how they start tracking these things. We even discovered that many agencies had invested hundreds of thousands of dollars custom engineering their own solutions to try and solve this issue - and that’s when we really knew this had some legs. Conduct the interview first, divulging as little information as possible about our idea so as to not bias the information. If it felt like a good fit, we made an offer at the end: $500 investment for early access to Parakeeto and the first year after launch, plus an ongoing discount. For the sales pitch, all we had were some mockups designed in sketch that I dropped into a keynote slideshow and turned into a clickable prototype by linking buttons to different slides. We didn’t even have a website at this point, and I was using a Gmail address to reach out to people. It was super early-days preliminary stuff. What went into getting your first 10 unaffiliated customers? After that exercise, it was time to start building the MVP. During the build phase, we created a website and started building a list of people who wanted access to the tool. I also started using social media to drive traffic back to the site. I tried to leverage a lot of passive automations: Instagram-like bots that would like photos in a specific hashtag grid, LinkedIn bots that would view a few hundred profiles per day, and continued email outreach. We then started looking for features on Podcasts and Blogs to get in front of people and connect with influencers in the space, and finally, we joined all the niche Facebook groups we could find. I can’t say that there was one specific strategy that really knocked it out of the park for us. All of these efforts individually have yielded small results for us, but collectively they have allowed us to get our first few paying users on the platform and a few consulting contracts as well. Today, how do you attract customers? Our main focus is on connecting with partners and getting featured on blogs and podcasts. We want to build a pipeline of organic traffic to our website. We’re playing the long game on this one, and there really are no silver bullets here. We also have some cold email and LinkedIn bots going at all times, which help drive a bit more traffic and conversations and will help us figure out what scripts and cadences work for when we’re ready to go up-market and scale an outbound sales engine. What makes your demo or free trial a great experience for customers? Because it’s the early days and the volume of free trials we receive isn’t that significant yet, we try to get on the phone with anyone that signs up, whether they churn or stay. Feedback and learning are our top priorities, because we’re still trying to find the right product and market fit with our early product. We’ve worked really hard to be responsive to our users, to iterate on their feedback, and to provide a hands-on experience to those who want it. We’re never afraid to offer a one-on-one call, and it’s usually me that’s getting on those calls. In what ways that “don’t scale” do you engage customers? Why do you do this? I try to call or send a personal video (via Vidyard) to anyone that engages with us. If you sign up for a free trial or download a lead magnet, you’re going to get a personal touchpoint from me. I’m also offering onboarding support to everyone who signs up today. Sometimes that involves setting things up for them, manually porting over time-tracking data, and lots of other things that don’t scale - which makes absolutely no sense at our price point, but again, learning is the most valuable thing for us at this stage so it’s worth it. In a few select cases, I’ve been known to send direct mail to get an important call. For example, I once saw someone tweet about having a craving for M&M’s and I sent them M&M’s via Amazon. They ended up giving me an intro to the CEO of their agency. I’ve been fortunate to have lots of incredible mentors in my life. First and foremost, my friend, mentor, and now partner in this venture Dan Martell and all the incredible entrepreneurs that I get to network with in his SaaS academy coaching program. He also brings in some pretty amazing people for calls with us, like Patrick Campbell from Price Intelligently, and recently Aaron Ross. Yves Doucet from Dovico has also been hugely influential and was really my first true mentor. He’s always been a big supporter of me and has helped me meet lots of the amazing people I learn from every day. 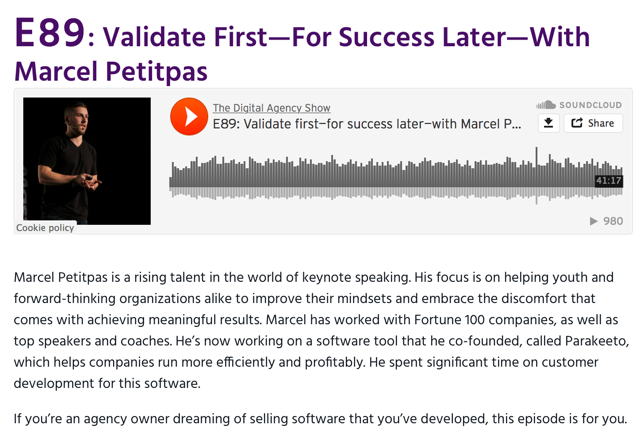 Marc Albert from DPL is a guy I lean on often, especially when I’m feeling a bit defeated as an entrepreneur. I try to read lots of books. Most recently some great books have been Hacking Growth, Lost and Founder, Extreme Revenue Growth and From Impossible to Inevitable. 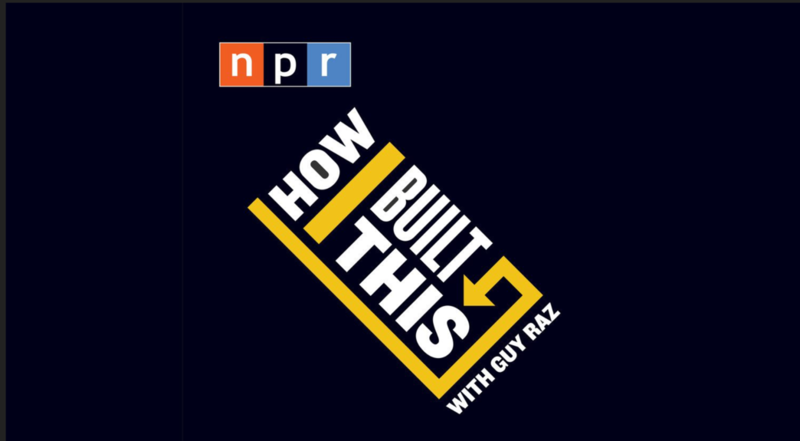 Of course, listening to NPR’s How I Built This reminds me that the challenges I face today are just a part of the process. What’s your advice for founders who are just starting out? 1.Start building an audience before you start thinking about software. Everything gets easier. This is something I’ve never done and truly regret. I can’t tell you how much easier it would have been to research, validate, pre-sell and bootstrap Parakeeto if we already had an email list with 1000 agencies on it. If you’re interested in a niche, start building an audience there and figure out what they care about. When it comes time for you to build a product, absolutely everything will be easier. 2. Don’t build yet. If you’re a sales-oriented founder, you’re going to want to build every feature people ask you about in early sales and discovery calls. If you’re a non-technical founder, you’re probably going to want to build just because you can. However - there’s a good chance in the early days that you’re better off not building for a few months after you think you’re ready. I wish we would have waited 6 months, sold more consulting services, and learned some of the things we’ve learned today before we started building our product. I truly feel that we’d be in a similar position as we are today, but we would have sunk way fewer dev hours into the product. 3. Try before you buy - early employees, partners, etc. I’m truly grateful that Jarod, Dan and I are a pretty good fit to work together. We share similar values, we get along fairly well, and when there’s friction it’s usually healthy and makes our ideas and decisions better. However, we have hired some people that didn’t work out and, in the process, wasted time and money. If there’s one thing I recommend it’s working with people - especially prospective partners or early employees - before making things official. Jarod has to talk me down off the ledge every week. I get an idea, a client tells me about a feature they want to build, or I see an opportunity and I start thinking 10,000 steps ahead. These are important things to do when thinking strategically about the future of a business, but in the short term it can really be a waste of brain space. Simplicity and a die-hard focus on solving one real problem for one type of customer is paramount in the early days. Being okay with not having everything and/or not being good at everything else is important too. Be clear about the problem you’re solving and your priorities as a company and always ask yourself if this “thing” you’re about to invest in really helps you get closer to that. For us, the problem is helping agencies see real-time profitability so that they don’t go over budget on client work. Our top priority is getting product market fit and accelerating our feedback loop. I’m lucky I have someone to challenge me every time I add a card to the backlog to keep us honest and make sure we’re driving towards those goals. If you want to learn how to run a more profitable agency or service business, be sure to check us out on social media or out our blog and podcast at parakeeto.com. We’ve got some great free lead magnets on there too. If you want to connect with me personally, hit me up on LinkedIn. The database of companies that I used for validation. The tool I used to scrape companies. Where I hired my freelancers. How I created my email campaigns. Where we’ve been featured on Podcasts and Blogs. How I send videos to people who have engaged with us. From 🤓💡💸 to 😳🔥💩, we're sharing everything on our journey to $100K in annual revenue.